The basic ideology behind this proposal is to consider humans as human be it they be belonging to any caste, religion or sect of the society, with a ‘helping hand’ as a Concept at Stake. 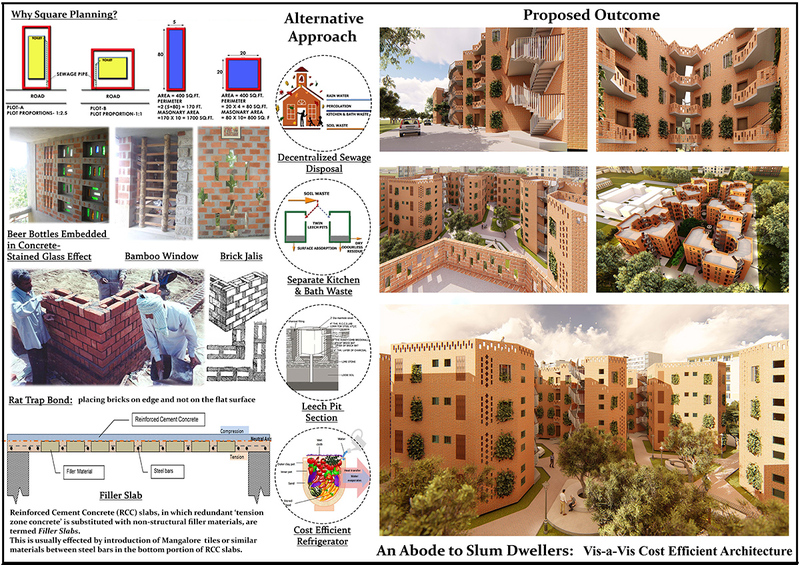 Since we as upcoming budding architects feel sensitized towards ailing conditions of slum dwellers in our nation. New Delhi grew into a modern capital city after India’s independence, with irresistible economic, social and political pull, with all kinds of work opportunities. It became a center of attraction for migrants from its surrounding hinder lands and beyond. These migrants who settled on vacant plots were people who could not afford the infrastructure of the city like housing, water, electricity, transportation etc. Hence the residents of such an area had to develop their own housing facilities on a permanent, semi-permanent or temporary basis which allowed them to be close to their economic source. As a result, this group’s first perception was to find a bare minimum land area for their existence. Hence all these settlements became highly dense and overcrowded without proper sanitation, lighting, water supply etc. This was always in contrast to the urban way of living and is referred to as slums the definition of which changes from country to country, place to place depending upon socio-economic conditions of each place. Then there are more other distinct cultures that have been able to mark their unique livelihood specialty and with their skill and reputation have established themselves in a particular place whilst still lacking basic amenities. There are many such communities to be acted upon in the capital city of our nation; one case considered in this proposal is in Patel Nagar. An illegal settlement in a dilapidated northern pocket of the city, this place is a thriving paradox. Its denizens draw their audience into a resilient world where anything is possible. 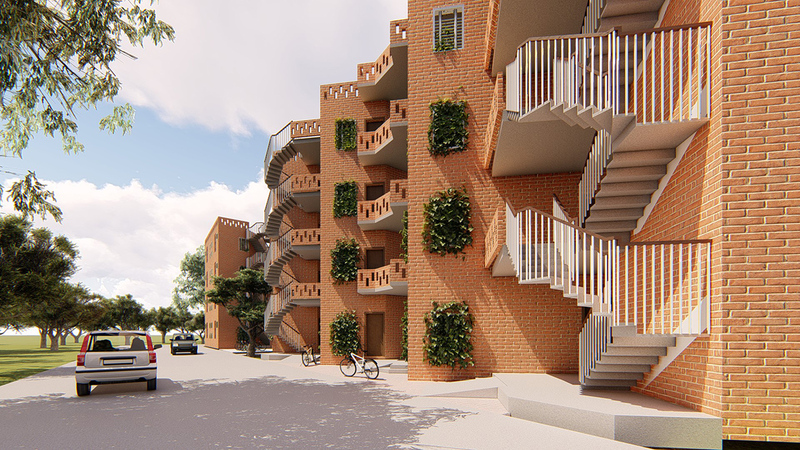 A rather dense to moderately dense, low-rise built mass, with a focus on mutual shading is majorly proposed for the development of this type of a harsh climate. The advantage of low-rise development lies in the increased contact with the ground, which helps to balance the in-house temperatures. Protection of outdoor spaces, mutual shading of external walls to provide shelter from winds during hot summer days and cold winter evenings, shelter from dust, and reduction of surfaces exposed to solar radiation are other important aspects to be considered. Furthermore, the desired orientation of the dwelling units is N-S. The masonry-adopted Rat-trap bond involves placing bricks on edge and not on the flat surface. 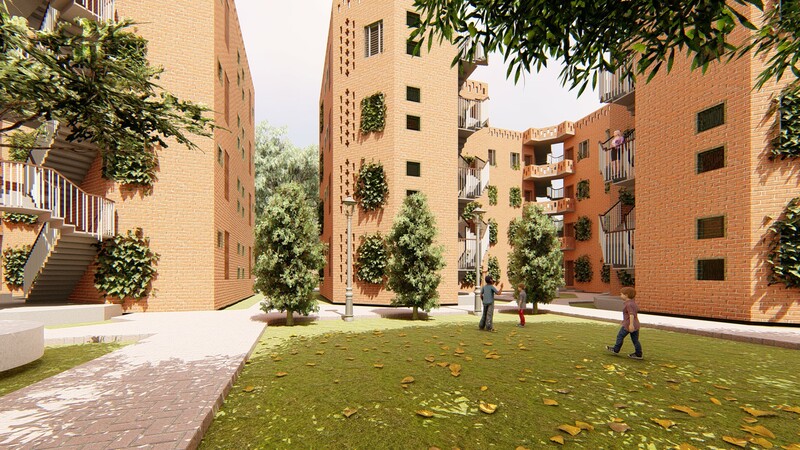 This also provides better thermal insulation via the cavity in between the bond, which helps in controlling the indoor temperature through aeration between bricks; thus helping to maintain better insulation from heat and cold. With this, the structure can carry 20% more load than the conventional Flemish bond and there is 25–30 percent cost reduction, as fewer bricks are used. In addition, there is no mortar required in the cross-brick middle; thus, saving 40­–50 percent of cement and sand that would have otherwise been used. Varieties of outdoor spaces are important for various day-to-day activities. Since the courtyard type of built form is suitable for thermal regulation, it is richly explored in design schemes. 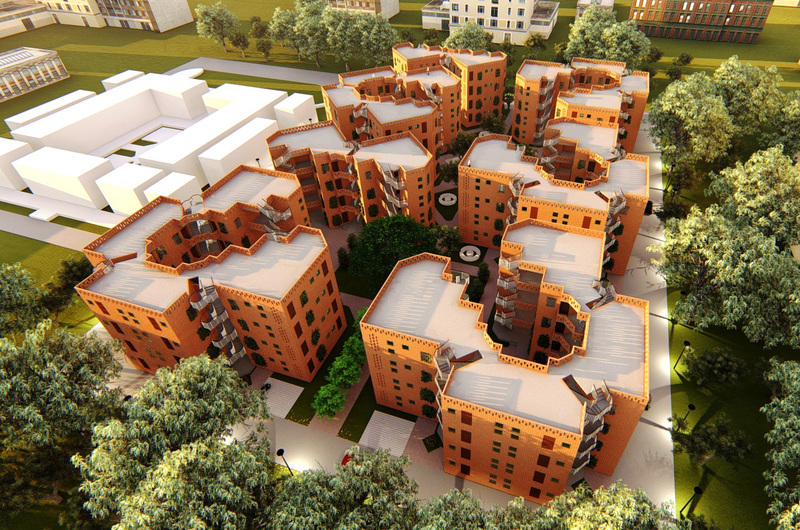 Then, the construction is up to G+3 as in the proposed design scheme of the slum rehabilitation undertaken. 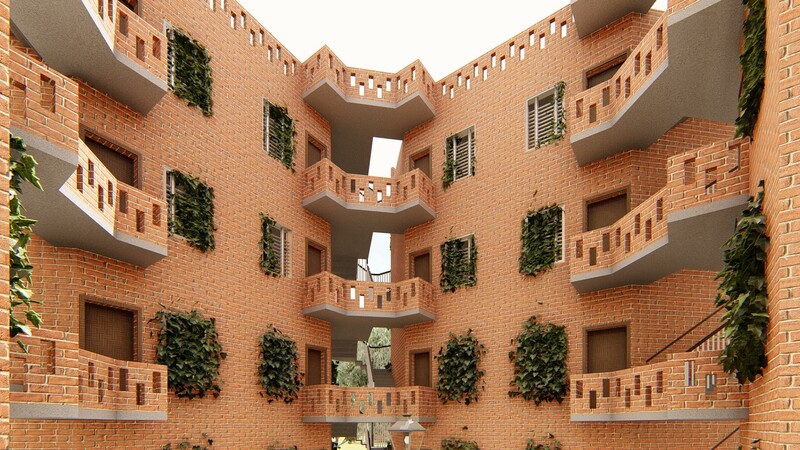 Subsequently, the foremost cost-efficient, as well as environment-friendly technique, is to use brick jalis (grids) on the walls. This also aligns with the vision of reducing the quantity of material used. At the same time, infusing fresh air into transitional spaces reduces the dependence on artificial ways of ventilation. The prime attraction of this technique is that it can be played into recesses and projections pretty well. We could even erect the jalied opening at an obtuse angle to make it act as a shield against the penetration of mosquitoes and another unwanted scrap at our ease. 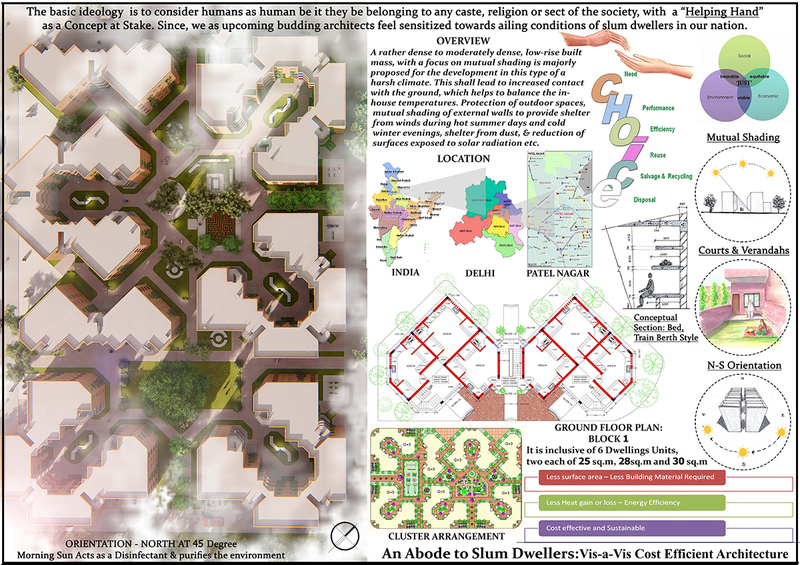 In addition, the monsoon wind direction should be a priority while designing a habitable building, since it is the nastiest condition against which ease and comfort must be provided to the occupants. The monsoon wind direction in New Delhi is mostly SE and E. Thus, we have incorporated techniques and precautionary devices to protect the façade treatment and the fenestrations provided in the building, such that it aids the well-being of the occupants rather than causing difficulties during sudden changes in the weather. 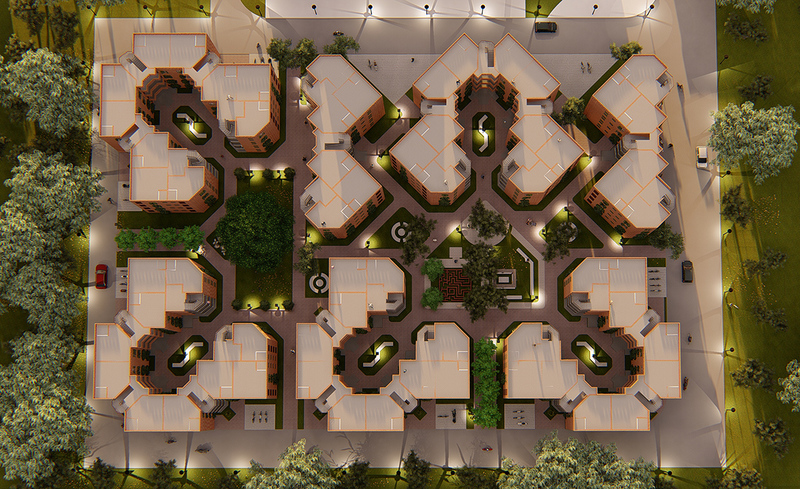 On a concluding note, the Design proposed caters to the living habits of the inhabitants with a focus on Common interactive facilities in each cluster with the vision to enhance bonding, spread harmony and unity amongst the residents. The special attention is being given to the women’s diversity with specific spaces to carry out the daily chores. Further, adequate spaces for children play and elderly interaction marks verandah’s and sit out under the shady banyan tree in every cluster. 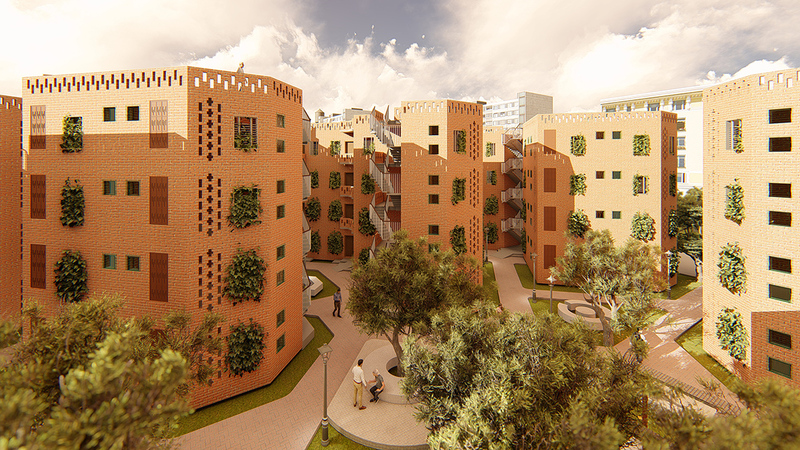 Hence, the prototype of the cluster designed inspires the erecting a small city within the capital city with the symbiotic relationship between the humans’ interaction and this study culminates towards holistic design solutions for the selected site with a view to have evolved as a sustainable neighborhood model. Some of them include avoiding sprawl to limit the use of vehicles, allowing integration of compatible uses, providing equal access to social and physical infrastructure, social inclusion incorporated in design by mixing diverse income groups, street design to encourage pedestrians, cluster formulation encouraging social interventions, and making streets safer by reduction of the thoroughfare and increasing natural surveillance and at the same time a sense of freedom to incorporate incremental approach for self-sustenance of the livelihood. Ar. Pappal Suneja: In the great field of Architecture, He personally believes that there are no Boundaries; there is no limitation to our imaginations and inventions. After graduating from Guru Nanak Dev. University Amritsar in May 2016, He has taught for a year at National Institute of Technology, Hamirpur. He is currently working as Asst. Professor at McGAN’S Ooty School of Architecture and is the Country Reporter for worldarchitecture.org and Head of Content for OutsiteVR Portal. He hopes that while proceeding in this direction; He is able to achieve great milestones while searching his ‘Everest’ in Architecture. Mr. Mayank Gupta: He is a person who is always in the search of the new things that he can learn from the surroundings. He is kind of a person who feels uncomfortable when someone makes him sit idle. He loves graphical designing and architecture and design are his passion. He is currently a freelance graphic designer and is Studying in B.Arch 3rd Year at NIT Hamirpur. Er. Beena Kumari: Her belief, as well as focus, is on sustainable options for the future of a smart society. She is currently working as Structure Faculty at Guru Nanak Dev. University, Amritsar and has submitted her Doctorate proposal on Concrete Filled Steel Tubular Frames to Civil Engineering Dept at Thapar University, Patiala.